I was recently interviewed by a journalist from the Tax Practice, June 2012 magazine. In this article I shared stories about my business; Greekalicious, my spiritual awakening and how I found my life’s purpose in 2004 in the small church of St. Fanourios in Mykonos, Greece. In 2004 whilst visiting Greece I questioned my life and asked God what my life’s purpose was. I also questioned why I was here how I could be of service to myself and others. Below is an extract from my book “My Greek Family Table” (Lantern) of my awakening experience. In August 2004, I went on a life-changing trip to Greece. It was my first visit back there since leaving Psara. While there, I visited Kalamata and many other beautiful islands. However, it was on the island on Mykonos that my life changed forever when I visited the small church of Saint Fanourios. It was here that my decision to pursue my passion for food was sealed and my destiny was set on a new course. Saint Fanourios is a very small church on one of the main winding streets in Mykonos. Beautifully whitewashed, it has the Greek flag hanging proudly outside. It had an inviting look about it and I felt compelled to go in and light a candle. The church was adorned with beautiful icons painted with vibrant colours and finished off with gold and silver. In the corner there were many candles that had being lit that day by people who had passed by. I felt a peace in my soul that I had not experienced before and the sweet fragrance of the holy basil heightened my sense of tranquillity. Suddenly I experienced an epiphany and saw all that was about to happen in my life pass before me. I realised it was time for me to re-invent my life and in that church I saw a new path set out for me to follow. Everything here speaks now, as it did centuries ago, of illumination. Here the light penetrates directly to the soul, opens the door and windows of the heart, makes one naked, exposed, isolated in a metaphysical bliss which makes everything clear without being known. While in the church I was unaware of which saint the church was dedicated to and what his significance was. I was so caught up in the moment that I did not notice the large icon of Saint Fanourios placed prominently in the middle of the church. I was, however, aware that when I came out of the church a very important decision had been made in my heart and soul and I felt empowered and inspired. I could not wait to embark on my new adventure in food. Outside the church was an old man, and I greeted him in Greek. He looked at me intently and then stated that it looked like I had found what I was looking for. I was surprised to hear his words and asked why he had said this. He proceeded to explain that the church was named after Saint Fanourios, the patron saint of lost things. People invoke his name in prayers whenever they want to recover lost items or people. He is commemorated on 27 August, the day the icon of him displayed in the church was found. I was fascinated by what the old man told me and interested in hearing more. He shared many stories with me, about people who had found good health or located lost loved ones. These touching and beautiful stories were like fairytales out of a book. I was there for what seemed like hours, discussing my future plans and my life with this complete stranger. He was at that moment the most important person in my life. 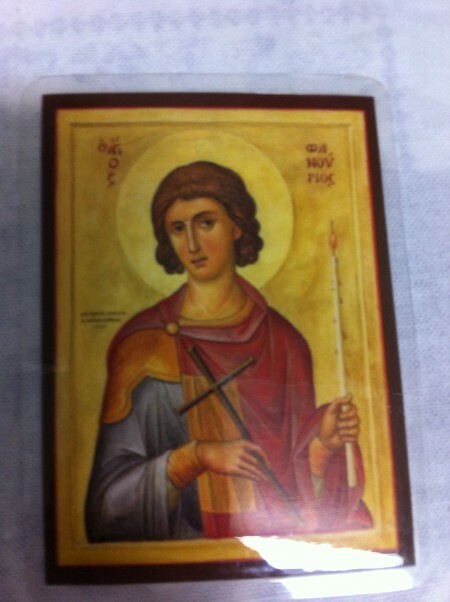 When we parted he gave me a small icon of Saint Fanourios and wished me well. I will always remember that day. I have since returned to Greece and of course I visited Saint Fanourios. He has found a special place in my heart and life. I treasure the icon that I was given and have affixed it to my fridge to bless my kitchen and all the friends and family whom I welcome into my home”. Since this day my life has never been the same. I am blessed to have found my life’s purpose and the true meaning of what it means to love myself and others the “agapi” way i.e. the Greek word for unconditional love. When you find your life’s purpose you live a more purposeful and authentic life. You see the world from an agapi state where there is no room for judgment of yourself and others, no room for ego, no need to control, no room for fears and you free yourself of any anger. To live the life you’re meant and the life you long for you have to be willing to start, shake things up a bit, face your fear, face your truth and slowly steady yourself to receive. It is not always an easy road but it is well worth the minor pain. When you declare your readiness for more joy and commit to the journey, the universe and God will respond in force, delivering people, events and things, all that you need to live and contribute your full potential. Be still and listen to your hearts desires and through meditation and prayer you will find your life’s purpose and live the life you have always dreamed of. Remember the many things that you are thankful and grateful for each day and this includes the privilege and honor of life. All will manifest at the right time and season. I wish you all well on your journey of self discovery. Enjoy the entire experience both the waves and the calm. It is all part of our growth and metamorphosis. I have included a recipe below for Fanouropita. This traditional pie is dedicated to Saint Fanourios This sweet cake is traditionally made, on the eve of Saint Fanourios’ name day, every 27 August. It is brought to the church of Saint Fanourios, where the priest blesses it with a special ceremony. After the Mass, the sweet cakes are cut and everybody shares pieces with each other. All patrons ask Saint Fanourios for help; however, before doing so they must ask for the saint’s mother’s sins to be forgiven. The wish for help can be to find anything at all – good health and happiness, lost items, lost relatives, peace, etc. The Fanouropita can also be made at other times of the year if someone wishes to ask Saint Fanourios to find something or someone for them. You can make the cake to ask for guidance on what your life’s purpose is as well if you wish. I sometimes dust some icing sugar on top. 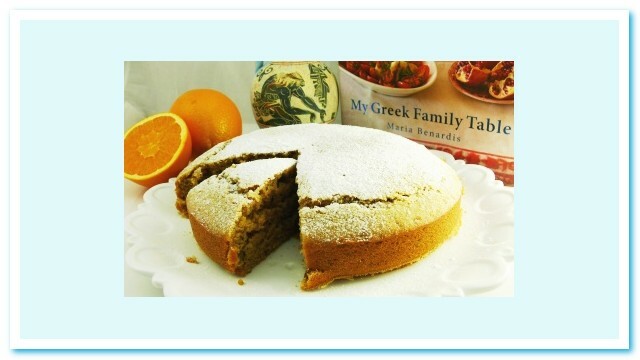 Recipe by Maria Benardis from her book “My Greek Family Table”. (Winner of the prestigious 2009 Gourmand World Cook Book Award (Best Mediterranean Cuisine Book in Australia). Place the olive oil, orange juice, cinnamon and sugar in a bowl and mix well with a wooden spoon until the sugar dissolves a little. Add the flour slowly while continuing to mix well. Then add the walnuts, followed by the baking powder. Continue stirring until the mixture is well combined. Turn the cake mix out onto a round baking tray lined with greaseproof paper and bake in the oven for 15 minutes. Then reduce the temperature to 130°C and bake for 30 minutes or until cooked. The cake is cooked when a knife inserted into the centre emerges moist but with no mixture sticking to it.